Good thing for Low dogs can't look up, right? Incase you missed it, a bonus page was uploaded yesterday so be sure to check that out. We're already working on episode 2. So please look forward to that. Low pulled a Sam Fisher! BOO YA! Haha yep, learn from the best. Great, Great, Great series. Keep it up. Hoping that girl is a recurring character. Thank you :) Yes we have lots planned for her. I also have another question. Do you use manga studio? Yes, manga studio is such a time saver for making comics. For the linework and paneling. I just got a wacom tablet! They're amazing, I'm still playing around with it.... Wait, I'm not logged in! You have a really nice, clean drawing style! 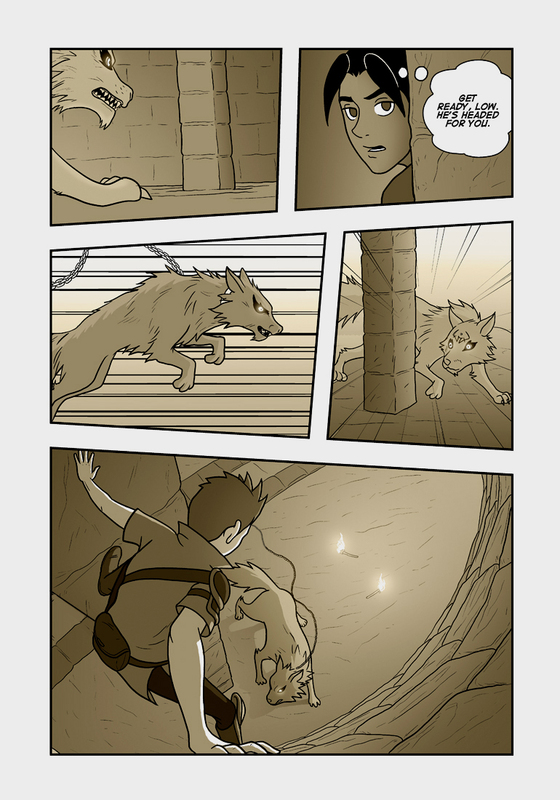 The bird’s eye view of the boy above the wolf was done really well. It is hard to make that kind of angle look believable. This is getting so suspenseful!